Recently, I was honored to be presented with a pair of awards by Ezzy Guerrero-Languzzi, to wit, The Silver Lining and Honest Scrap Awards. Thank you, Ezzy! Sometimes we have some general idea of what prompts people to think well of us. Other times, we are recognized for something specific. In this case, I know exactly what led Ezzy to consider me for the Honest Scrap Award. It was this revelation about my past. How do I know this? Elementary, my dear Watson... she told me so! Thank you for the award, Ezzy. We've been pals on Twitter for the better part of a year; in the real world, that translates into something like two and a half lifetimes. As we each grow in our blogging, writing and tweeting, I'm grateful that the real-world truths about friends translates well into the digital world: attract new tweeps, but keep the old - one is silver, the other is gold. HONEST SCRAP - can you handle the truth? 1. Both of my thumbs are double jointed. 2. When I was in high school, I ran a very profitable business with a friend. By leveraging our key assets (my smooth talking, his car, our joint entrepreneurial spirit), we bought a wide variety of alcoholic beverages which we re-sold to our classmates at a huge markup. The business grew so successful that by the end of senior year, we were able to get a bulk discount from the liquor stores for some of our larger orders. 3. I've been hit by cars twice - once on my bicycle, once as a pedestrian. 4. The high point of my weight was about 230 pounds, in 1996. In 2003-05, through a combination of diet and exercise, I got down to 170 pounds. This was right in my ideal body weight range. 5. Since then, through a mixture of complacency, stress and illness, I've gained back about 25 of those pounds. I now weigh 195 pounds. I'm working on getting back down to 175. 6. The first album I ever bought was a cassette of Scott Joplin rags. The second was a 45 of Joan Jett and the Blackhearts doing their cover of "I Love Rock 'n Roll". 7. Beginning at the age of ten, I sold newspapers (the old St. Louis Globe-Democrat) on a busy street corner every Saturday morning, from 5:45am - 10:30am, rain, snow or shine. When I was twelve, I added a Saturday night corner (5:30pm - 11:00pm) selling the early Sunday edition of the Post-Dispatch. When I was thirteen, I added a Sunday morning stint (5:30am - 12:30pm) selling the full Sunday edition of the Post Dispatch. I did all three for a few years, but eventually sold off my Saturday morning and evening corners to other kids. I continued to do the Sunday morning corner all through high school (sometimes desperately hung over from Saturday night). 8. My first time deer hunting, I rushed my shot and wounded a nice six point buck. I spent the next three hours tracking and chasing it for miles and miles through frozen woods and half-frozen swamp. Exhausted and half-frozen myself, I lost it in the woods as night came on and a fresh snowfall was obscuring the blood trail. I still feel guilty about not having made a clean kill; every deer I've shot since then has been guided by that memory. 10. I bowl tolerably well. When last I was in a bowling league (~15 yrs ago), my average was around 165. My highest scoring game in regulation play was 261. And now, the awards portion of the show. 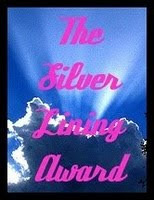 Instructions on The Silver Lining Award are to present it to bloggers who inspire you in some way. I always look forward to the tweets and posts from these folks - they are the kind of people who increase the quality of the tweetstream in a significant way. 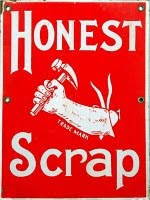 The Honest Scrap Award is pretty simple. List ten things about yourself that some of your blogger friends might not already know about you. Now, I realize that this may not be the first time that these folks have gotten these awards. That, dear reader, is simply an indication of how worthy of note they are. Read them, follow them and enjoy! You are very worthy of these awards! You have very interesting and delightful truths. What a hard worker you have been - even if one was illegal. That hunting incident crushes me to read. Surprised you ever went again. Scott Joplin? What a funny kid you were. Well, maybe we all need revising, but you are a rare, golden writer - must be the magic in the double jointed thumbs. Thank you for passing the honor on to me, I am humbled. Congrats to you and your choices! The real Tony tells you a lie. The real Tony tells you a truth. He's done it since he was a youth. It's not that he wants to evade. But from lemons he makes lemonade. When he tells you a lie, you are happy. When he tells you the truth, then you weep. Which is which? That's a secret he'll keep. Poor, Bambi. And poor you, by the way, with the cars. I'd be permanently scarred. When I first started writing, the mere thought of having to "re-write" annoyed me. Why would I have to? Fast-forward, now I'm cursed with revision-itis. Nothing is ever good enough. So I can totally relate. I enjoyed the poem. To write fiction, we all have a special blend of the liar and truth-teller running through us, right? You deserve the awards, Tony. I look forward to your tweets and blog posts every week. Love your energy. Cheers! Anne, Ezzy & Linda, I'm glad you liked the poem! I reposted it on the front page, to give it a little more life. I thought it encapsulated some of the essentials of writing fiction. Tony - I love your post - I especially like #6! In my youth (ok, even still ...) i had very eclectic tastes in music. On my post i'll share a little something that relates to #6 ... stay tuned :-) Thanks so much for the award! !